Dateline: January 18 2013 Minus 25c We were taking off on one of the last planes to depart from Heathrow before the blizzard closed in that morning. We had a tight schedule flying two hours forward into the time zone for a gig with Finnish hero’s ‘Silent Scream‘ at the Ravintola Kuudes Linja club in the heart of down town Helsinki. Our arrival at Helsinki airport nearly two hours late, meant for a speedy 20 kilometre drive straight to the venue. The Finnish are not phased by the cold or snow, over here the piled up snow in the spaces between the parked cars has taken on an air of permanence Not like the ‘anglo slush’ but more of a feel of hard granite, you wouldn’t want to crash your motor into this! The cars were all moving – they had snow tyres, folk were going about their daily business, to them this was normal. Soon they would arrive in their hundreds for our show. We got out of the transport and the cold literally took our breath away, we made haste and prepared for the sound check. We were greeted by the promotion folk and by members of Silent Scream, they all seemed relieved that we had made it. After the sound check, it was interview time and we huddled around a digital audio recorder whilst Oskar Terramortis asked the questions. Instead of eating we stayed at the club and watched some of Silent Scream who made an impressively big sound, guitars that sounded like great valkyranian horns. Their music was intelligent and their performance in front of the home crowd was awesome. The bass player has a fascination with 60’s and 70’s Brit comedy movies like the ‘Carry On’ series, all of the band were really friendly as was a great deal of the audience as it turned out. It turns out that Rock Music generally in Finland, is the nations Pop Music. All respect to the Finnish, they are a tough bunch, they have to be to survive the harsh climate. We were reminded however that Finland had a much better summer in 2012 than the rain sodden mire we had here back in blighty. But even for Finland it was cold, in fact the coldest evening of the winter of 0′ 13 so far. Then it was time for our performance, we would be premièring a number of new songs from the album, and had to stay in focus. Then we were on. The set flashed by in ultra quick time, visions of crowds of enthusiastic punters rocking out down the front, they were round to one side as well. At the back people watched, some standing on things, there were red digi lights and flashes going off in the crowd. The crowd were warm then they got hot, making lots of noise as we changed songs. There was a couple of minor odd glitches, but overall we were reasonably happy with our performance. It was new guitarist Johnny G second gig with us, his first was in Berlin back in November. Since his arrival and the new material the band feels like it’s really beginning to fire on all four cylinders. Ed, Ray and Johnny are getting down to the groove, Spon is soaring above and Abbo caresses and taunts giving performance that defy. Following our show the audience queued up to meet us and we chatted and signed merch and memorabilia away the following hour. After finally eating the most awesome veggie kebab cooked up by a couple of fine Soumi dude chef’s, we hastened to a down town bar where a hall at the back was assigned for an after show party. We continued networking and drank away the next couple hours before heading to the hotel for some well earned sleep. The following morning following breakfast and a short band meeting, there were a couple of hours to spare. We decided to hang out for a bit where the harbour meets the city centre. It was a beautiful bright sunny day despite the cold, a bunch of us threaded our way meaningfully down to the harbour. We were astonished to see the Sea frozen and as we watched, an icebreaker was ploughing it’s way through the ice towards the jetty. 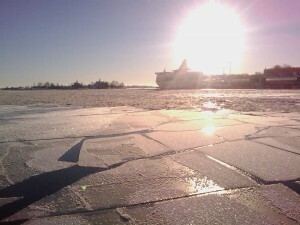 The harbour was a glorious vision of crunched and refrozen ice. To add a sense of surreality there were a couple of futuristic leviathan super cruise liners frozen in situ straddling the harbour edges. The classical architecture of the city was the backdrop with the hustle and bustle of humanity going about their daily normal business unfolding before us. We walked round to what looked like the focal point of the harbour area and by a ring of stone turtles. Che magically produced some fine Beaujolais wine that we drank in plastic glasses as the sun reflected untold shades and sunbeams in the ice. The wine literally froze solid before we had chance to finish and soon it was time to make our way back to the airport and home. It wouldn’t be a story without a twist, the transporter was late picking us up to return to the airport, it turned out it was so cold the diesel had frozen in the tank! Hastily transport was rearranged and got us back to the airport only just in the nick of time, but despite the cold, it made us sweat! This entry was posted in viewpoint and tagged 2013, carry on, frozen, helsinki, Oskar Terramortis, Ravintola Kuudes Linja, silent scream, ukdecay by Mr Phibes. Bookmark the permalink.